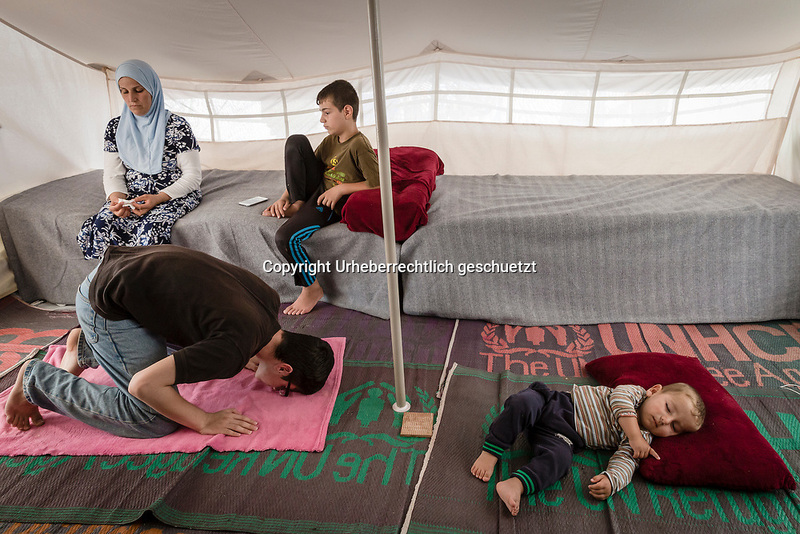 Greece, Lagkadikia, Refugee Camp, Judi, age 15, is praying inside the family tent, while his brother Abdulla is sleeping and his mother is sitting in the tent with his brother Shahin. Hayfa Sadiq, age 34, is staying in this camp since end April 2016 with her five boys age between 1,5 and 15. Judi, age 15, Mohamad, age 12, Shahin, age 9, Abdul Rahman, age 6, Abdulla, age 1,5. Her husband, Mazkin, age 42, and father of the kids, is living in Berlin, Germany. He is accepted as refugee seeking asylum. They family is form Haseki, North Syria.